Though the barometer may suggest otherwise, one of the telltale signs of spring in New York is the annual arrival of Rare Book Week, going on now through March 12. Besides the various pearls for sale among the well-stocked stacks at the three book and ephemera fairs, holding court around Manhattan are a slew of shows and exhibitions dedicated to celebrating the people and things of the book world. 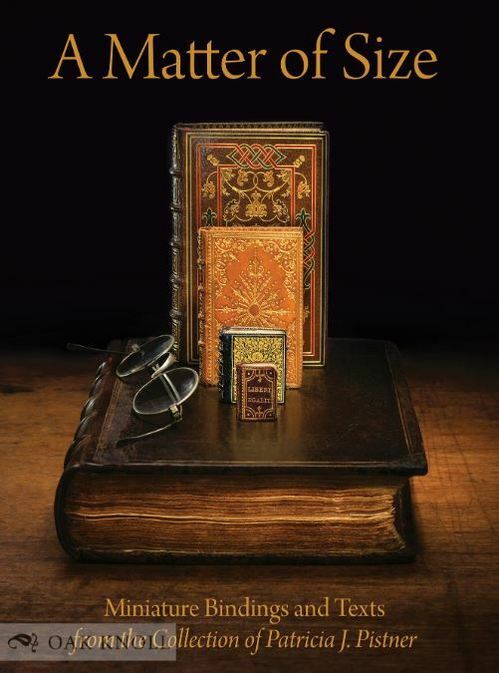 One that serious bibliophiles should not miss is the Grolier Club’s exhibition of Pat Pistner’s miniature bindings and books, now on view in the second floor gallery. The 275-item installation–a misleading number, given that some items, like the 42-volume set of Sherlock Holmes mysteries is counted as one piece–spans the history of texts written on a diminutive scale. A miniature Babylonian cuneiform tablet accounting “plucked” sheep dating from approximately 2340 BCE shares space with sumptuous illuminated Books of Hours and contemporary artists’ books by Timothy Ely and Nancy Gifford. From an archive that currently includes 4,000 items, the Naples, Florida-based bibliophile whittled down her selections to those she said best represented the considerable historical scope of her collection. Out of so many tiny treasures bound in gold, silver, and other precious elements, can Pistner possibly have a favorite? “I love all of them, but these are perhaps my most prized,” she said, gesturing to a case containing 16th-century miniatures from France and Italy. She graciously posed for a photograph holding up a liturgical miniature called the Enchiridion p[re] clare ecclesie Sarum, a 1528 tome hailing from the collection of Charles Louis de Bourbon, Duke of Parma. The text dates to the 16th century, but the binding was by Pierre Marcellin Lortic, a 19th-century binder. Another, less dramatic (but no less significant) prize sits in a wall case in the hallway: a miniature printing of Abraham Lincoln’s Emancipation Proclamation. 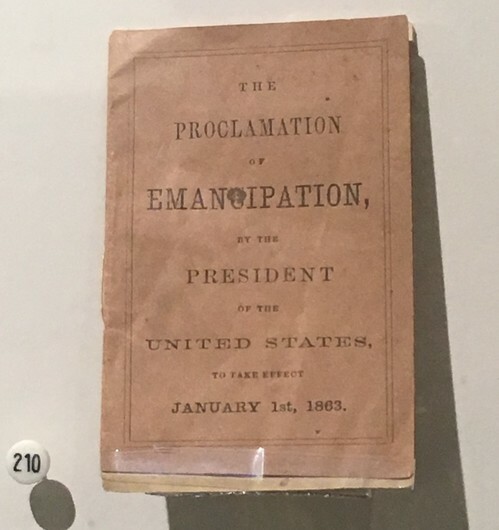 Issued in 1862, the unassuming single-section pamphlet in tan paper is Lincoln’s preliminary proclamation freeing the slaves and the first printing in book form of the text. In a hurried effort to spread the word, 50,000 copies of this mini were distributed by Union soldiers to African Americans as they marched through the South. “Not many remain in existence,” Pistner explained. This one, like nearly every other item in the exhibition, is an exquisite example, all a reminder of the major role miniature books play in understanding the history of the written word. “A Matter of Size,” is on view now through May 19. Free lunchtime exhibition tours led by the curator will be held on April 24 at 1 pm and May 18 at 3 pm. No reservations necessary. The accompanying 476-page, fully-illustrated catalogue ($95, Oak Knoll) is a meticulously compiled resource that covers the breadth of Pistner’s collection as well as its place in the bibliosphere. The exhibition originated in 2017 at the Victoria & Albert Museum in London where most of the items on display are part of that institution’s permanent collections. The show then made its way to the High Museum in Atlanta before setting up in Boston. The goal of the show is to explore various relationships between a bear and a boy, the interplay between Milne’s text and the art of E.H. Shepard, and how classic children’s literature remains relevant in the 21st century. 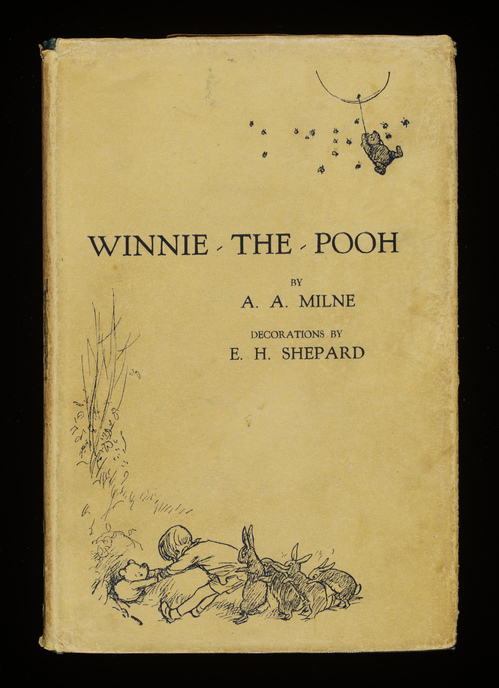 Highlights include Shephard’s first character portraits of Winnie, Eeyore, Kanga, and other creatures of the Hundred Acre Wood, a 1926 handwritten letter from Milne to Shephard, and photos of Milne’s family. The show is definitely geared towards children, and the MFA curators have installed various interactive elements, such as recreations of Pooh’s home and the childhood bedroom of Christopher Milne, the inspiration for Christopher Robin. Cuddle-worthy corners throughout the gallery invite children to read, draw, and even listen to a 1929 recording of Milne reading Winnie-the-Pooh aloud. Co-sponsored by Hood Milk, visitors who attend on opening day can enjoy games like a round of ring toss on the MFA’s Huntington Avenue lawn along with generous servings of cookies, milk, and Hoodsie cups. To paraphrase Pooh himself, you can’t stay in your corner of the forest waiting for this show. Check it out before it heads back to London. 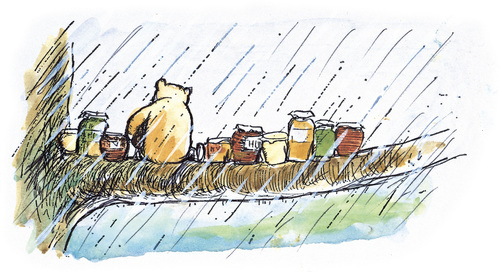 “Winnie-the-Pooh: Exploring a Classic,” runs from September 22nd through January 6th, 2019 at the Museum of Fine Arts, Boston. More information at www.mfa.org. Images, from top: Winnie-the-Pooh first edition, 1924, published in London by Methuen & Co. Ltd; printed by Jarrold & Sons Ltd.
“Pooh sitting on his branch … beside him, ten pots of honey,” 1970, Ernest Howard Shepard.